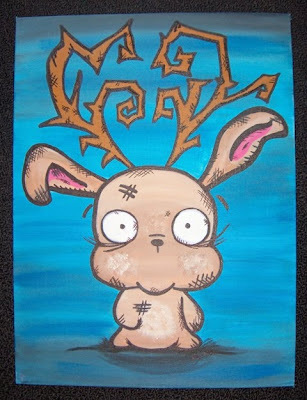 Like I said before, I love cryptozoology and I think jackalopes count for that. Don't they? Okay, so they are not based in any truth or myth, and more just like tall tales, but whatever. I have seen them listed on cryptid websites and I like them either way. I painted this one last year for a store I sell my art in on the Oregon coast. I really love this one for some reason! The colors and the bewildered look on his face are my favorite parts about it! I love him and his name! Too cute! Hey! I finally had a minute to sit down and catch up on some of your posts that I hadn't gotten to read yet. You've done so many amazing things already this year! I love your work so much. Keep it up, you always make me smile from ear to ear. I'm going to send you a Craftser message: I have an idea.